Is your roof leaking? Has it become compromised? If you are experiencing a leaking roof now, don't delay and risk increased damage to your home. Keystone Contracting LLC makes emergency roofing calls 24 hours a day, 7 days a week. If the area is experiencing widespread weather issues, we may not be able to immediately fix your roof problems, but we can provide emergency tarping to protect your home from water damage and keep your family dry. Call the Roofing Experts Now! Not all emergency roofing services are the same. Quick service doesn't need to mean shoddy service. Call Keystone Contracting LLC for immediate (yet quality) service now. 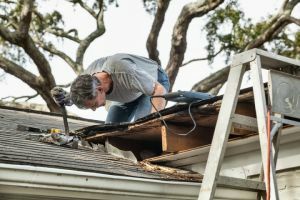 The biggest issue when you have suffered roof damage is to immediately contain the problem to reduce the changes of additional damage to your home. If a leaking roof is not covered as soon as possible, water can penetrate the building, seeping into the walls and flooring. This may require costly repair work. Call Keystone Contracting LLC immediately if your roof has been compromised, 24 hours a day. We'll arrive quickly to contain the leaks by providing a temporary tarp until the weather clears and the repair work can be completed. Once the problem has been identified and the damage has been contained, Keystone Contracting LLC will return to your building to properly repair your roof. If you will be making an insurance claim, we can help with that too. Every detail will be handled with professionalism and care. Roofing tiles will be matched and seams will be hidden as we repair your damaged roof. The end result: you'll never know your roof had been damaged. Keystone Contracting LLC has provided emergency roofing repairs in the area since 2012. Call (732) 201-3542 today to fix your roof and you'll soon learn why we've become the local favorite. Your beautiful newly repaired roof will withstand weather and time when cared for by Keystone Contracting LLC.